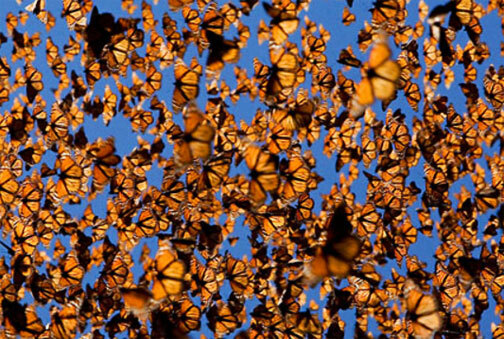 The Monarch butterfly is famous for its southward migration and northward return in summer from Canada to Mexico and Baja California which spans the life of three to four generations of the butterfly. Female Monarchs have darker veins on their wings. Photo © by Kenneth Dwain Harrelson. 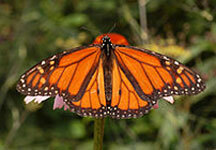 Male Monarchs have a spot called the androconium in the center of each hind wing. Photo © 2007 by Derek Ramsey. March 28, 2013 Lawrence, Kansas - In the 1970s, Monsanto began producing the herbicide glyphosate, a broad leaf and grass weed killer called Roundup. Farmers liked it because it would kill many different types of weeds. Then Monsanto came up with genetically engineered corn and soybean crops that had their DNA altered to resist glyphosate. Farmers could now spray glyphosate everywhere without killing their corn and soybean crops. By 2007, glyphosate was the most used herbicide in United States agriculture. But what came next were “Superweeds” resistant to glyphosate. Monsanto scientists told farmers to simply apply more glyphosate.